Mr. Altaf-ur-Rahman Khan is the founder, team leader and senior partner of the Firm. He did his LL.B in 1970 from the Punjab University Law College, Lahore, in first division with distinction. Thereafter, he joined the Pakistan Air Force (PAF) and served in the legal and administrative branch for about two decades and reached the rank of Wing Commander. Mr. Khan sought voluntary retirement from the PAF in 1989 and started practice of law as an Advocate at Lahore. 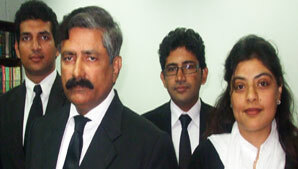 In view of his legal experience in the PAF, Mr. Khan was given direct enrolment as an Advocate of the High Court. Mr. Khan worked as an Associate with two leading law firms of the country namely; Hassan & Hassan (Advocate) and Akram Sheikh Law Associates before setting up his own Law Firm. Mr. Khan has long, extensive and intensive experience of litigation and consultancy in the Civil, Corporate, Banking, Real Property, Cooperative, Employment (labour & service), Housing Development, International Trade, Contract Management, Consumer Protection, Insurance, Environmental and Muslim Personal laws. He has represented his clients in several hundreds of cases before all the courts of law from the original to the highest court of appeal. Mr. Khan is currently Legal Advisor and Attorney to a number of companies including a prestigious Housing Authority, a City Development Authority, Pakistan Air Force and many Cooperative Housing Societies and legal entities. As Legal Advisor to a renowned food processing company selling chicken products country wide he played key role in its revolutionizing of business excellence. Mr. Khan is external legal counsel to multinationals such as Metro Cash & Carry International as also Legal Advisor to known Banks and a Non-Banking Finance Company. During his service in the Pakistan Air Force, in the legal branch, Mr. Khan conducted numerous court martial proceedings as well. To provide supreme quality, innovative and result oriented services and solutions to its clients and to assist them with its optimum capabilities. Our goal is to secure the clients’ interest and gaining his trust through immaculate transparency, swift actions and communication.